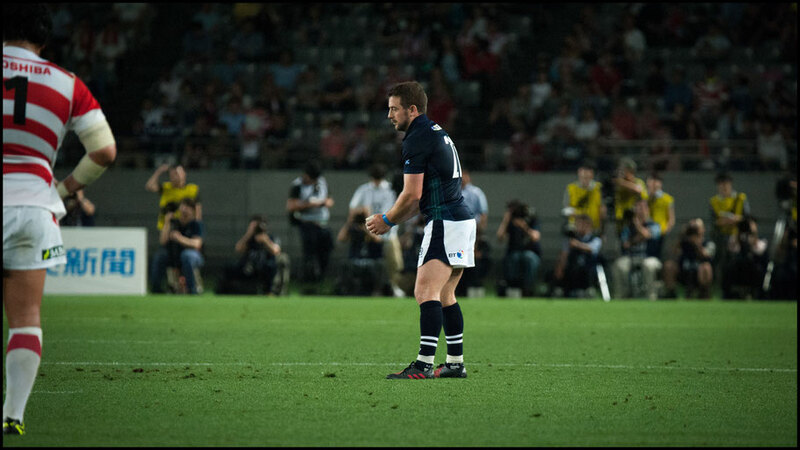 Scotland wrapped up its June tests against Japan with an unconvincing 21-16 win over the hosts at Tokyo’s Aijinomoto Stadium, securing a 2-0 series victory. 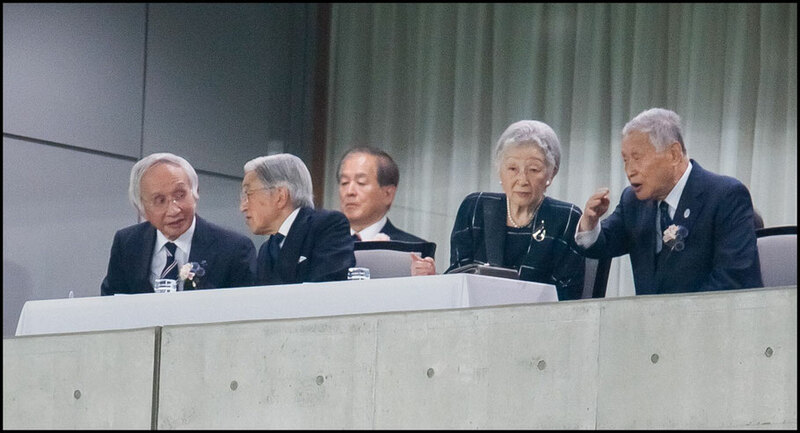 Although it was the Japanese who scored the game’s only try, lost opportunities at crucial times allowed Scotland back into a match attended by the Emperor and Empress. Japan had chances to win, but a lack of clinical finishing when it most mattered. The Scots were under the cosh right up to the 70th minute, when two penalties finally give the visitors a lead they would not relinquish. In the opening stanza, Henry Pyrgos got the Scots on the board with two penalties while Yu Tamura grabbed one for Japan. The Brave Blossoms thought they had scored the first try when center Tim Bennetts intercepted a wayward Scottish pass to run unopposed under the sticks. 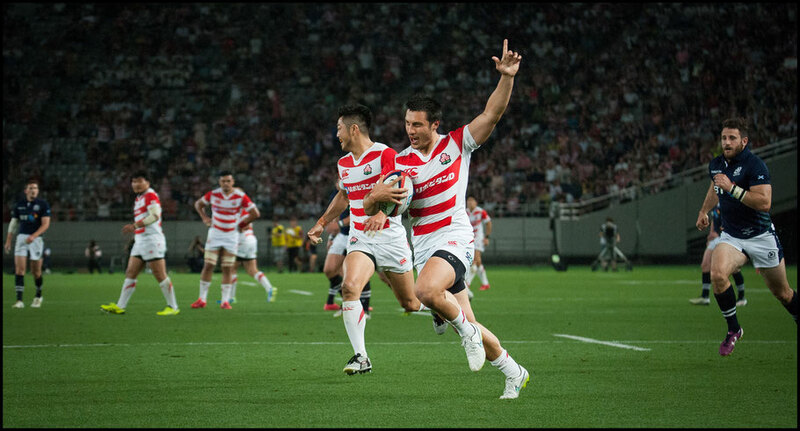 Although that five-pointer was disallowed, Japan was just warming up, and soon scored a try highlighted by counter-attacking speed, guile and unstructured play that had the Scots gasping for breath. Starting inside the Japanese 22, the move swept left then right at break-neck speed, before no.8 Amanaki Mafi combined with Shokei Kin bursting through the line and he offloaded to Keito Shigeno who raced away to score. Tamura added the conversion and the bewildered Scots were down 10-6. Pyrgos reduced the deficit to one point but penalties either side of half time by Tamura extended Japan’s lead to 16-9 with 30 minutes to play. Scottish coach, Vern Cotter brought on first-choice flyhalf Greig Laidlaw to replace Pyrgos in the hope of stirring the Scottish team into action. The plan worked as over the next 10 minutes Laidlaw booted two penalties to make it a one-point game. 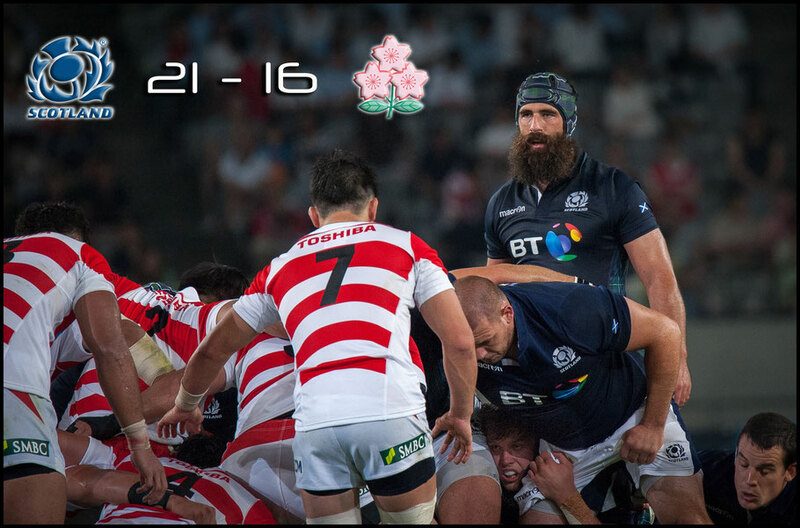 Japan sent wave after wave at the Scottish line but could not break through until Kosei Ono botched a certain try. As the replacement center dived, he lost the ball forward over the try line. 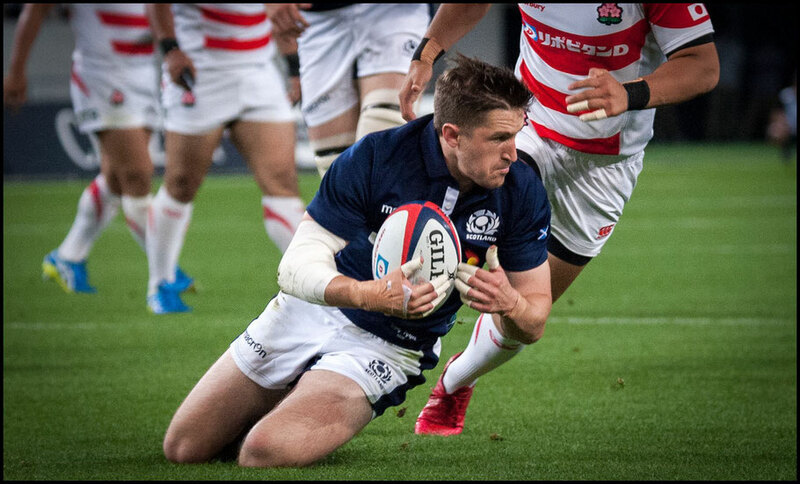 Scotland regrouped and spent the last 10 minutes camped in the Brave Blossoms’ half, kicking two more penalties to take the lead and hold on for victory.